If you were to place grass on mycelium, it would turn the same color as the mycelium's grass to fit it. Also, this should be compatible with tallgrass. Players now are able to find Abandoned Castles on Mooshroom Islands. Also, Mooshroom islands are much bigger and have a higher chance of spawning. They can be crafted into Mushroom Planks, which you can use to decorate with, along with Mushroom Plank Stairs and Slabs. Mushroom Cake heals 8 hunger points, just like Pumpkin pie or steak. Mushroom Infected Zombies are here to make Mushroom islands a little more difficult, and they spawn in Mushroom Caves, which I forgot to mention. Mushroom caves are just caves going deep into the island with the regular ores here and there, but have mostly Iron Ore.
Well that's my small idea to make mushroom islands a little more interesting. If you were to place grass on mycelium, it would turn the same color as the mycelium's grass to fit it. Also, this should be compatible with tallgrass. If I'm not mistaken, mycelium is a fungus that is infecting the grass. Making grass like mycelium sort of neglects the point. not to mention it doesn't make sense realistically. 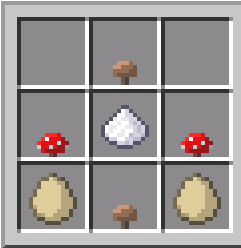 If you were to use an axe with the enchantment Fortune on a Giant Mushroom's stalk, you would receive Mushroom Stalk (More about later) I would like this, but shouldn't the enchantment be silk touch? Players now are able to find Abandoned Castles on Mooshroom Islands. Also, Mooshroom islands are much bigger and have a higher chance of spawning. Abandoned Castles sound interesting. As for the rarity, mushroom islands are supposed to be hard to find. Mooshrooms and no hostile mobs are found nowhere else, which is why everyone journeys far and wide to get them. Mooshroom cake is now craftable using : Mooshroom cake? Unless I'm mistaken cake and mushrooms don't go well together. Plus we already have a lot of food, what would make this different? How much hunger does it restore? Mushroom infected Zombies exist. Which would ruin the idea of mushroom islands be hostile mob free. That being said mushroom zombies does sound interesting. Maybe they only spawn in abandoned castle spawners, or only spawn when a zombie touches mycelium? They can be crafted into Mushroom Planks, which you can use to decorate with, along with Mushroom Plank Stairs and Slabs. I don't know if that makes much sense, mushroom stalks are not made of wood and are generally bendy. They wouldn't be good to build with. Abandoned Castles are found by chance, and contain generic loot such as gold and iron. The model for it is downloadable here : (Still in progress. Download will be released later.) Don't post this if you haven't finished. Or you could not mention the model and edit the thread later with it. As the actual structure, what is it made of? How big is it? It should probably contain at least something unique that makes it worth raiding. Mushroom Cake heals 8 hunger points, just like Pumpkin pie or steak. Would have been good to know up above. I still don't see the point of mushroom cake. We already have a lot of food, and none of them are that unique. Mushroom Infected Zombies are here to make Mushroom islands a little more difficult, and they spawn in Mushroom Caves, which I forgot to mention. Then put it back up in the beginning when you mentioned them! You do realize you can click wherever you want when typing a post, right? Right now everything is all over the place and hard to understand. For the zombie spawning, as I said before this would neglect the point of mushroom islands being hostile-free. Responses in bold. 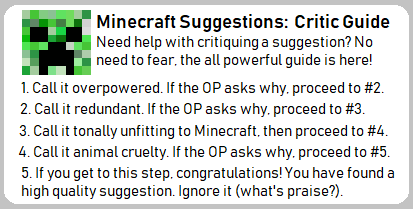 This is a good basic idea, I'm all for more biome-specific things, but I disagree with the direction you've taken this.